How Are We Still In This Thing? ~ The Bucky Channel - The World of Sports from Wisconsin's Perspective. Home » C.C. Sabathia , Chicago Cubs , Dale Sveum , Eric Gagne , Guillermo Mota , Jeff Suppan , Milwaukee Brewers , New York Mets , Paul Maholm , Pittsburgh Pirates , Prince Fielder » How Are We Still In This Thing? I gotta admit, I thought we were done. I really did. After that Phillies series, I thought we were dead meat and the playoff drought was going to reach an unbearable 27 years. Now? After a 4-1 win over the Pirates, and a Mets collapse against the Cubs on Wednesday? 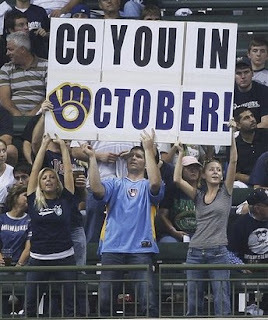 I'm still not convinced the Brewers are going to get in, I won't let myself think that until their tickets have actually been punched. But I'm feeling a hell of a lot better than I did two weeks ago. Even two days ago. On short rest, Sabathia somehow was able to go seven innings, gave up just one run off four hits, and somehow found it in him to strike out 11 batters. Hats off to Dale Sveum for pulling the trigger in his quest not to give Jeff Suppan another start this season, and hats off to Sabathia for delivering. Offensively, the credit goes once again to Prince Fielder, who extended his hitting streak to 14 games with his RBI single in the 4th. From there, let's give some credit to Paul Maholm. By walking two runners home with the bases loaded in the 4th, Maholm pulled a Yancy Thigpen by became yet another native from the 'Burgh to help a team from Wisconsin on their quest to the playoffs. Elsewhere, Gagne pushed his ERA down to 5.56(!) with a scoreless 8th, and Torres earned his 28th save of the season. Torres did give up a solo shot to Adam LaRoche however in the 9th, and I'm getting a little worried about him at the back end of the bullpen. But that's for another day. Now, with the win under their belts, it was up to the Chicago Cubs to deliver and knock off the Mets. When that game got to the 9th inning, they were tied 6-6. Bear and I were sure that the Cubs were going to tank the game, because they probably had no desire to take the game into extras. Our thoughts were confirmed when Ryan Theriot held on to the ball for a suspiciously long time before trying to get the lead off runner out at 3rd. It didn't matter though, as the Mets blew it, leaving a runner on 3rd base for 5 straight innings. The Brewers won, the Cubs came through, and once again the Brewers are in a position to win the Wild Card. TBC's Player of the Game: CC you in October. any idea who threw that pass to thigpen? aaron rodgers?